Presentation on Q1 2009 Earning Report of Ebay Inc.
View more presentations from earningreport. Remember the Razorfish Facebook Connect scenario making e-commerce truely social? Well, it's not a scenario anymore: digtal agency Fluid launched their FluidSocial product, enabling Facebook Friend-based shopping and merchandising; and implemented it on Vans.com and Jansport.com. 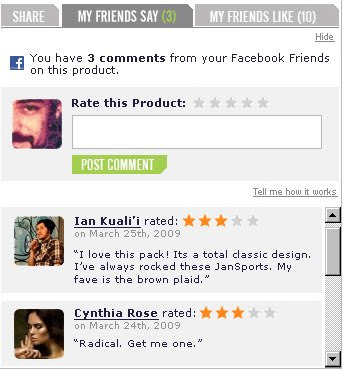 FluidSocial enables conversations (comments and live chat) with your friends directly on a product page. - For online retailers, these friend interactions allows for shoppers to never leave the site to get feedback from friends. - For shoppers, it lets them see ratings, comments and real-time chat on specific products from friends whose opinions they value and trust more than from strangers. Ju’s data suggests the total slice of U.S. e-commerce through Amazon was about 34% in Q4, up from 27% a year earlier. Could Sold Out Products Increase Email Click Through? Chad White from the Retail Email Blog recently spotted this email from TigerDirect that dynamically updates image files when a product sells out. This practice prevents the frustration and disappointment when one clicks to a product that’s no longer available, creates urgency for other products and may prompt the recipient to open TigerDirect emails right away in the future.